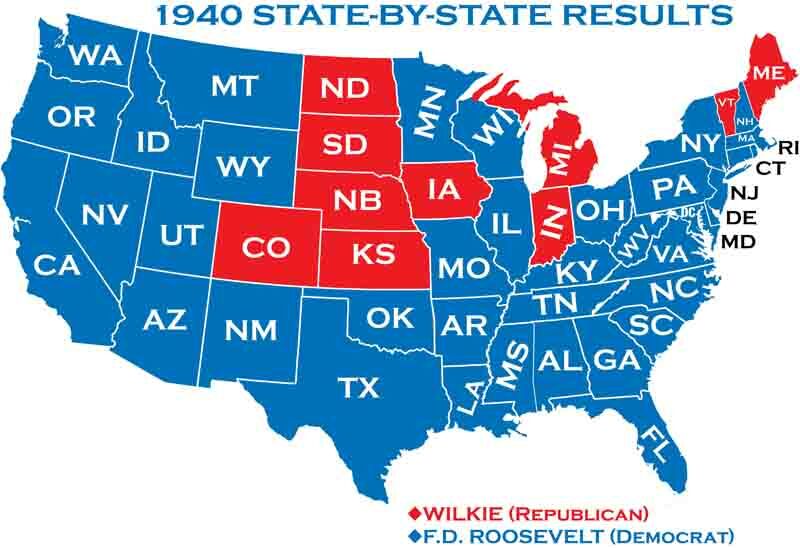 The Republican convention of 1940 resulted in one of the largest upsets in election convention history. 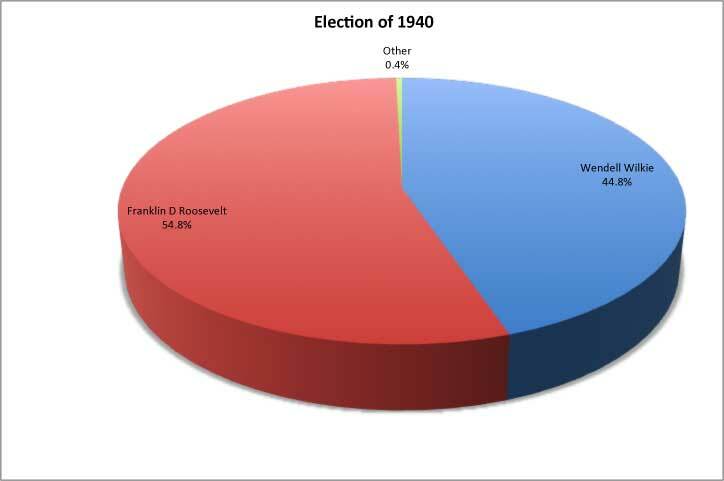 In early 1940, the leading candidates for the Republican nomination were: Senator Robert Taft and Thomas E. Dewey, the New York District Attorney. As the international situation became worse, with the fall of France, both Taft and Dewey were considered by many as too isolationist. Wendell Wilkie’s candidacy was promoted. Wilkie, who was best known as a utility executive, and had opposed Roosevelt's TVA. Wilkie was an outspoken supporter of American support for the Allies. When the time came for the balloting, Dewey led on the first three ballots. However, the galleries demanded Wilkie. On the fourth ballot, Wilkie took the lead. Wendell Wilkie clinched the nomination on the fourth ballot. 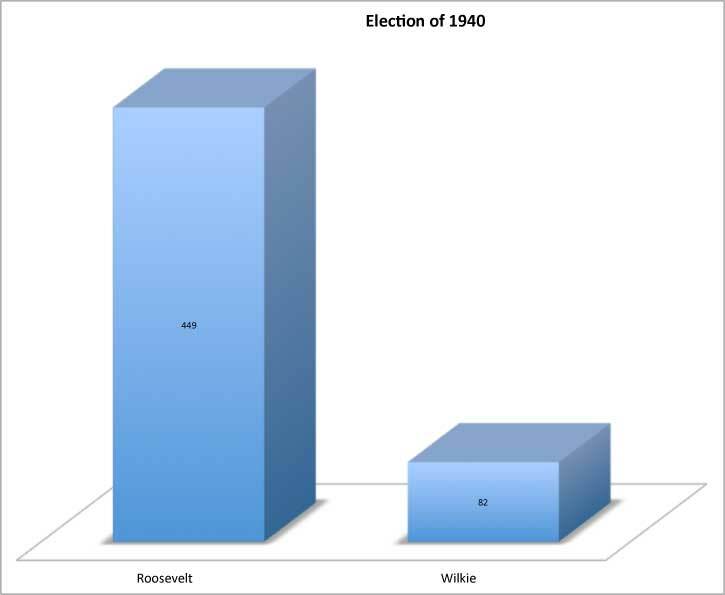 As the election of 1940 approached, the question arose as to whether Roosevelt would break with American tradition and run for a third term. The start of the war in Europe, in September 1939, persuaded Roosevelt to seek a third term. Roosevelt made it clear he was available for a draft by the Democratic party. The delegates at the Democratic convention chose to do just that. The Republicans met in Philadelphia in June. There were three leading contenders for the Republican nomination. However, none of these leading candidates won. Instead, the party picked a political novice, Wendell Willkie. Wilkie was a Wall Street novice. Though he was charismatic and colorful.